Tourism makes up the largest sector of the state economy. Florida is known around the world for its balmy weather. The state's mild winters have made it a haven for retirees. Florida is perhaps on of the most widely enjoyed states in the country thanks to its enjoyable tropical climate and tourist centered cities and attractions. The state is located in the Atlantic and Gulf coasts, and is bordered on its west side by the Gulf of Mexico, Alabama and Georgia to the north, and the Atlantic ocean is on its east border. The state is ranked as the 22nd most extensive state and the 4th mostly populated, while being the 8th ranked in population density. The capital of Florida is Tallahassee however its largest city is Jacksonville. Another interesting fact is that the South Florida metropolitan region is the biggest in the southeastern United States. 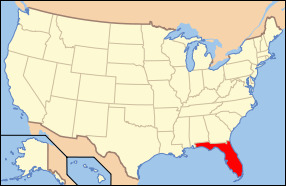 Most of Florida is part of a peninsula that sticks out between the Gulf of Mexico and the Atlantic ocean. The state of Florida has the longest coast in the contiguous united states, and much of the states area sits at sea level or very close. The overall climate in the state can vary from subtropical in its north region to tropical on its southern end. The state is also home to the Everglades which is an extremely large wildlife and swamp region making great habitat for the American Alligator, Manatees, and Florida Panthers. Europeans first made contact with the land compromising Florida in 1513 led by the Spanish explorer Juan Ponce de Leon. The overall culture of the state consists of a wide variety of Native American, African American, Hispanic, and European American. These cultures can often times be found in the local architecture and cuisine. Florida's state bird is recognized as the Mocking Bird while the state tree is the Cabbage Palmetto and the state flower is the Orange Blossom. 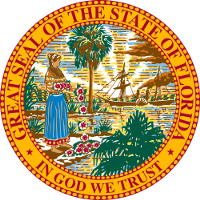 The state is also widely regarded for its universities such as the Florida colleges, Florida Business Schools or the Florida Art Schools. The state has a diverse agricultural background but is primarily centered around citrus, nursery stock, dairy, sugarcane, and vegetable farming. Furthermore, Florida has a wide variety of industries prevalent in the state but the biggest ones include tourism, food processing, transportation equipment, electrical equipment, printing or publishing, and various machinery manufacturing. The highest point of elevation in the state is known as Britton Hill which sits at only 345 feet above sea level. The overall climate and scenery of Florida helps draw tourists year round, however the city life and attractions make it one of the most entertaining states to visit. Whether it is one of the large cities such as Tamp, Miami, Orlando, or one of the many enjoyable beaches lined with resorts, Florida continue to draw people from all over the country and abroad.